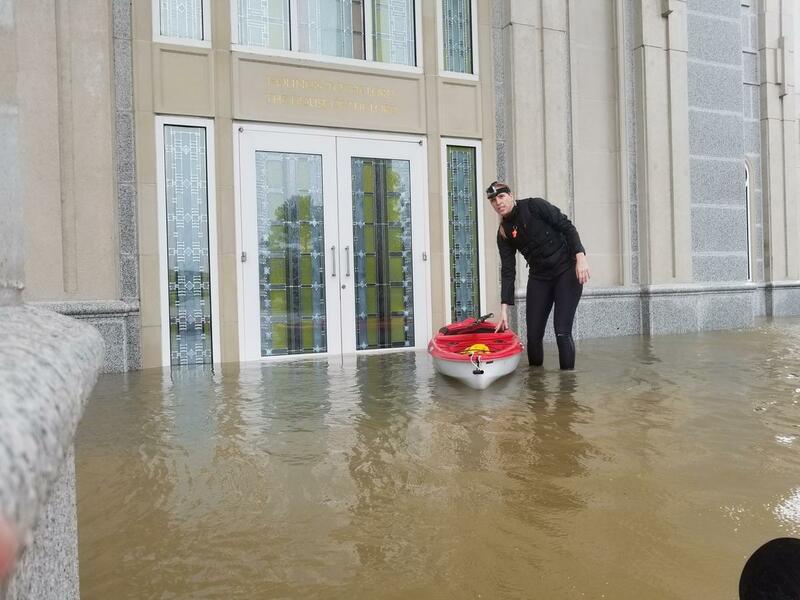 Over the weekend and on into Monday, Harvey’s floodwaters displaced hundreds of Mormons, breached the faith’s Texas Houston Temple, damaged meetinghouses, canceled Sunday worship services. Leaders at the headquarters of The Church of Jesus Christ of Latter-day Saints in Salt Lake City and local leaders in Texas activated the faith’s humanitarian aid networks. The temple sits at the intersection of Cypresswood Drive and Champions Forest Drive. Cypress Creek has flooded Cypresswood Drive, reaching the second story of some homes. Temple President Marshall Hayes confirmed Monday night that the temple was flooding. “The creek became a river and the current is so strong that it’s been dangerous to even try and approach the temple,” he said. Nearby Cyprus Creek rose by more than 20 feet. “It appears water to the depth of four or five inches has gone inside the temple,” he added. “That includes a baptistry, a marriage waiting room, dressing rooms, kitchen and laundry. We haven’t been able to go inside so we really don’t know the extent of the damage.” The temple closed Saturday after the 11 a.m. session. Water also breached an adjoining building.